In finance, equity is the market valueMarket Valuation ApproachThe market approach is a valuation method used to determine the appraisal value of a business, intangible asset, business ownership interest, or security by of the assetsTypes of AssetsCommon types of assets include: current, non-current, physical, intangible, operating and non-operating. Correctly identifying and classifying the types of assets is critical to the survival of a company, specifically its solvency and risk. An asset is a resource controlled by a company which future economic benefit owned by shareholders after all debts have been paid off. In accounting, equity refers to the book value of stockholders’ equity on the balance sheetBalance SheetThe balance sheet is one of the three fundamental financial statements. These statements are key to both financial modeling and accounting. The balance sheet displays the company’s total assets, and how these assets are financed, through either debt or equity. Assets = Liabilities + Equity, which is equal to assets minus liabilities. The term ‘equity’ in finance and accounting comes with the concept of fair and equal treatment to all shareholders of a business on a pro-rataPro-Rata RightA pro-rata right is a legal term that describes the right, but not the obligation, that can be given to an investor to maintain their initial level of percentage ownership in a company during subsequent rounds of financing. basis. Owners of a company (whether public or private) have shares that legally represent their ownership in the company. Each share of the same class has the exact same rights and privileges of all other shares of the same class, and hence where the term equity (meaning equal) comes from. Companies can issue new shares by selling them to investors in exchange for cash. Companies use the proceeds from the share sale to fund their business, grow operations, hire more people, and make acquisitions. Once the shares have been issued, investors can buy and sell them from each other in the secondary marketSecondary MarketThe secondary market is where investors buy and sell securities from other investors (think of stock exchanges). For example, if you go to buy Apple stock, you would purchase the stock through a trading exchange, from investors who already own the stock, rather than Apple. Apple would not be involved in the transaction (how stocks normally trade on an exchange). Financial analystsFMVA™ CertificationThe Financial Modeling & Valueation Analyst (FMVA)™ accreditation is a global standard for financial analysts that covers finance, accounting, financial modeling, valuation, budgeting, forecasting, presentations, and strategy. are typically concerned with the market value of equity, which is the current price or fair value they believe shares on the business are worth. Since finance professionals want to know how much return they can make on an investment, they need to understand how much the investment will cost them, and how much they believe they can sell it for. To learn more about how financial analysts value companies, check out CFI’s Business Valuation Fundamentals Course. 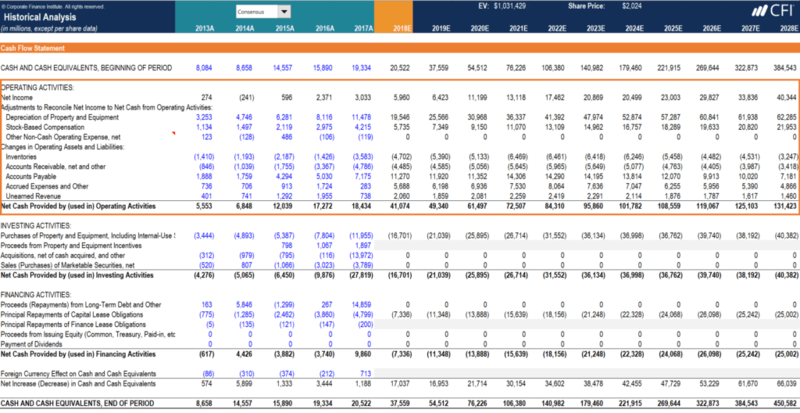 In the example below from CFI’s Financial Modeling Course about Amazon, you can see how an analyst would build a Discounted Cash Flow (DCF) model to forecast the company’s cash flows into the future and then discount them back to the present. After netting out debts owed, the resulting value is divided by the number of shares outstanding to arrive at the intrinsic value of equity per share. Accountants are concerned with recording and reporting the financial position of a company, and therefore focus on calculating the book value of equity. In order for the balance sheet to balance, the formula Equity = Assets – Liabilities must be true. To learn more about financial statements, check out CFI’s Accounting Courses. 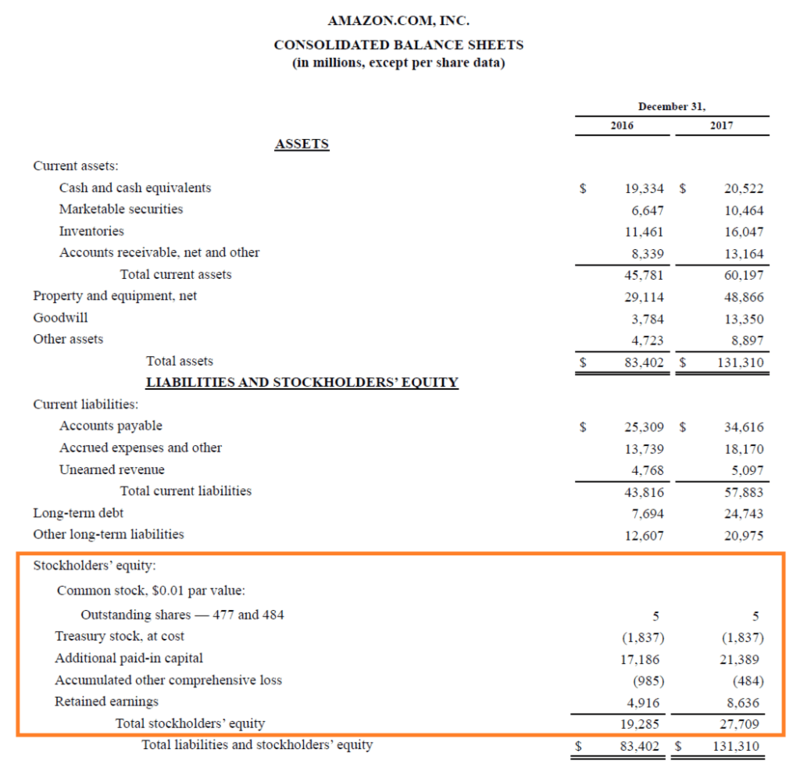 Below is a screenshot of Amazon’s 2017 balance sheet which shows a breakdown of the book value of its stockholders’ equityStockholders EquityStockholders Equity (also known as Shareholders Equity) is an account on a company's balance sheet that consists of share capital plus retained earnings. It also represents the residual value of assets minus liabilities. By rearranging the original accounting equation, we get Stockholders Equity = Assets – Liabilities. As you can see in the image, in 2017, the company reported total stockholders’ equity of $27.7 billion. The main difference between market value vs. book value is that market value is forward-looking (expectations about the future), and book value is backward-looking (recording a history of what happened in the past). Finance professionals are typically concerned with forecasting or estimating how a company will perform in the future, and hence the focus on what’s going to happen. Accounts, on the other hand, are focused on providing a detailed and accurate picture of what has actually happened, and hence the focus on the past. Since one is forward-looking and the other is backward-looking, there may be a large discrepancy between market value and book value. It is not necessarily a “good” or “bad” thing if the two values are similar or different. In order to assess how large the gap is between the market value and book value of a company’s equity, analysts will often use the Price-to-Book (P/B) ratioMarket to Book RatioThe Market to Book ratio, or Price to Book ratio, is used to compare the current market value or price of a business to its book value of equity on the balance sheet. Market value is the current stock price times all outstanding shares, net book value is all assets minus all liabilities. The ratio tells us how much.